Are there areas of your life that you’d like to become better at, yet taking the necessary steps never seem to make their way to the top of your priority list…or at least stay there? That is very true for me. So I am seizing the inspiration of a New Year and the clean slate it brings. 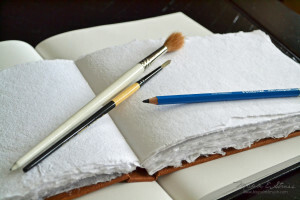 Only in my case, it is blank sketchbooks and blank sheets of watercolor paper that I am looking to leave my mark on rather than a ‘clean slate’. They lie ready to be filled with inspiration, expression and creativity…and have been for more time than I care to admit. Painted on the loft in my studio is a quote by Emile Zola… “The artist is nothing without the gift, but the gift is nothing without works.” I have been challenged by that, so I am taking intentional steps to be sure that I spend my artistic gift on all that blank paper. With that said, I am committing to create a new piece of art each week for the rest of the year…and share it with you! While I love to draw and paint, I have to admit that I have an ulterior motive here. I am doing this because I want to expand my gift. I’m sure this sounds crazy, but doing a quick, loose sketch or painting is far more challenging for me than the realistic, tight, detailed work that I am known for. So, I want to try to push myself to be faster and looser in my work…something that is so hard for this perfectionist!! This is one reason why I have decided to walk this challenge out before you. By posting works that I will be creating in a limited amount of time will be a way of putting out there ‘less than perfect’ work. As hard as this will be for me, I am hoping that in time this vulnerability and practice will break me of the need for so much control in my work. One would think watercolors would have broken me of that by now! Risk-taking is no doubt an integral part of obtaining things that seem out of reach. I want to pursue things in art that I normally avoid. I used to avoid painting people, but then I followed God’s call and that turned out okay for me! So now I am wondering what else is hiding in the shadows of my fears and insecurities. I am hoping to find freedom in my work, freedom from perfection, freedom to enjoy my gift more and freedom to fail. So I invite you to join me on this journey to freedom and untapped potential! Making myself accountable to you each week will at last make me follow through on my goals here…which is the other reason I am inviting you to walk alongside me. Please keep in mind, these will be small, quick works of art…nothing like my big, detailed watercolors. I may spend 5 minutes on some and 5 hours on others, depending on my week and the subject matter. This year-long challenge is not about sharing great work (though I hope to! ), but about further developing and expanding my gift. It will be about more expression and less perfection. I’m crazy excited and terrified over this, but the adventure of discovering what lies in those shadows of my fears and insecurities is exhilarating already! At last I will begin filling those sketchbooks with something more than good intentions. So what about you? What area of your life would you most like to invest in this year? May I gently suggest that our own initiative is the greatest thing we have to achieving our goals. Come on, we can do this!! How exciting! I can’t wait to see what unfolds on those blank pages before you. Whatever it is and looks like I know it will be beautiful because of the artist and the One who inspires her. Isn’t this what God would have us do? Step out in faith as we put our gifts back in His hands and trust him with where He is leading us? I love this and I am so excited to see what other gifts and surprises this reveals. Expect great things! Keep your eyes on Him and enjoy the adventure! Well, good for you!! I strongly relate to all that you said. I am sure you already know that art pieces do not have to be perfect, nor completely finished, because the human eye looks at the work, and the brain fills in the details while looking. When you finish it yourself, then others don’t get the chance to see it from their point of view. Therefore, you are giving others a wonderful opportunity! Yay! The Holy Spirit constantly amazes me with the way He works in our lives. Our “ideas” are testimony of His Presence, Michele–and it will be by His power that you follow through–impacting others and growing yourself. What an awesome God we serve!! Thank you for letting us all be part of this wonderful step of faith. Get His paint brushes stroking as you respond to His inspiration–and bless us! Michele, What you do the Lord will bless, because he’s given you the gift and called you to the work. You’re always in our prayers and admiration. Thank you for your courage to be so transparent. You inspire me to at least consider courage in adversity. That is all God needs, right? A small toe hold in my mind? Sweet friend so happy to find your blog, Beautiful work! Michelle, I’m a little late to the party but amazed by it all. Seeing the wonderful journey you are on and the great results both internal and on paper inspire me. It encourages me to ask God about my own journey. Thank you for sharing and being so vulnerable. Another one was sent to my step-brother who has been bedridden since Feb. of this year. He is also a believer and is always so positive and encouraging to everyone around him – even in such a bad health situation. Again, this card is a beautiful visual of God's love through us – no matter what! This card is so special!! It applies to so many different situations. It is through your gift that you so wonderfully share with others – that many people whom you may never meet are ministered to! I just HAD to say THANK YOU & never give up doing what you do best: Show the love of our precious Lord & Savior – no matter what is going on in our life!! Oh, thank you so much Vivian for sharing!! I am very sorry for the losses surrounding you. I am blessed by the way you are pouring into those grieving and struggling. And thank you for pouring into me with your words. You are a gift of encouragement!! Be blessed for the blessing you are!